Tucked into the far northeastern corner of Colorado is the small town of Holyoke. The surrounding lands have always been productive, and water pumped from the Ogallala Aquifer has helped irrigate the fields. It is in this area where the Sprague family has been farming for more than 60 years. The farm has been productive in good years and has weathered the bad years, and the current generation of Sprague family is determined to make sure the family farm continues to do a healthy business. To ensure the farm’s operation stays in good health, the Sprague family added a new step to its winter-time chores. Along with getting some much needed rest, repairing buildings and vehicles, and attending to anything else which came up, the Sprague family got together and formed a plan. They laid out their goals of what they wanted to achieve in the upcoming season with the farm. They determined how much money they wanted to make and how much they could expect to make. After mapping out expenses, the potential for income, and estimating several other factors from weather to the availability of water, the Sprague family found themselves in a confident position when it came to start the work of the growing season. To understand the plan the Sprague family put together, you must first know a little about the Spragues. Four brothers formed the Sprague Brothers Cooperative Farm in the 1940s, and over the years, it has evolved into EWS Farms. Russell and Kimberlee Sprague took over the farm after they finished high school. Russell managed the farm’s operations and Kimberlee managed the books. The couple had five children. Knowing the benefits of education, they urged their children to peruse college educations. Two of the children, along with their spouses, have returned to Holyoke and the EWS Farm after graduating to join Russell and Kimberlee in working on the farm. The newer generation of the Sprague family is also involved in off-farm jobs and activities. The eldest son, Aaron, coaches football (along with Russell) for the local school district and Aaron’s wife Amber teaches Spanish. Eldest daughter Desiree is also a teacher and her husband Aaron Mosenteen also helps out in running the local football program. The lessons learned at college were not forgotten, and the eldest son Aaron was able to convince his family that they all had an interest in ensuring the long-term viability of the farm. Aaron is also a co-developer of the SRMP and has applied the system to his own farm to improve and validate the program. In many ways, EWS Farm is a typical family-owned operation. 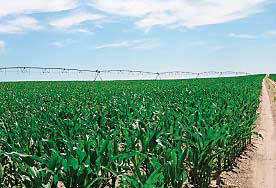 It boasts 2,500 acres of tillable land; 500 acres of that are irrigated by the Ogallala Aquifer. The farm is solely a commodity production business, and that makes crop rotations an important component to the success of the business. The primary commodities are corn for feed and hard red winter wheat. Through marketing and forward contracts, having a price in mind of when they want to sell, the Sprague family has been able to minimize the risk that accompanies running an agricultural operation. Aaron admits they may not always hang on to sell when a commodity hits its high-mark on the season, but they aren’t selling at the low point, either. It was a good season for EWS Farm. Even though it was a hard season for water, and drought seemed to loom all summer like a thunder cloud that wouldn’t rain, the farm once again turned a profit. In the winter, the Sprague family will once again look at their goals, see what they want to achieve, and come up with a plan to map out the best way to make those goals a reality.